Abandoned by a mother who did not want a second daughter, Mae grew up on the periph-ery of her aristocratic Korean family. Her loving step-grandma (a commoner) took care of her, allowing her to explore the joys and perils of their rural home. 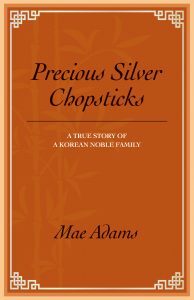 Mae describes her emergence into Korean culture, from her Japanese-style education to her most prized possession: her pair of silver chopsticks. She endures her mother’s abuse, almost-tragic accidents, and her father’s funeral. But things get much worse. At the end of World War II, Mae and her family flee to South Korea, while her grandma stays behind to give the family time to escape. Within five years the Korean War erupts, and again they spend several years as refugees before Mae came to the United States for a col-lege education. Her memoir delves into Korean history and the Japanese occupation, following Mae until her happy ending: marriage to a US Marine colonel and a family and career of her own. From her childhood in a North Korean mountain village to a successful life in the United States, the years have brought Mae Adams many challenges. With the past full of ghosts, her final challenge is to share her story. Made Amazon bestseller a few times in the category of Korean history. 81 reviews with average 4.7 stars.